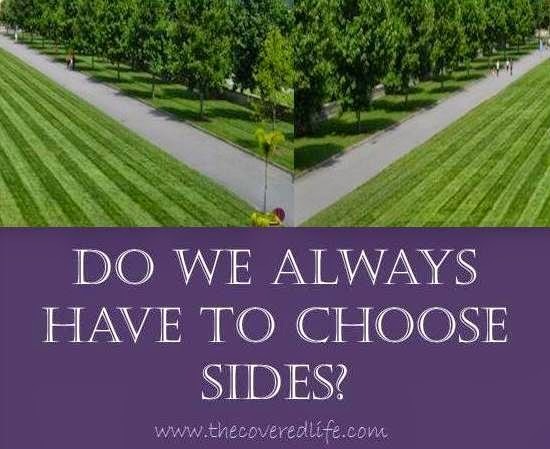 The Covered Life: Do We Always Have To Choose Sides? A few weeks ago, I was startled by a Facebook post I saw by one of my favorite bloggers. I am not mentioning names or entire details, but just suffice it to say that there was apparently some hurt feelings within a ministry that resulted in a split. I was bothered by the post on Facebook, because it was in reaction to this taking place. The person didn't bash the group or cuss them, but instead spoke of the injustice and the hurt she felt. Now you may think that this is fine, since she wasn't actually being mean, but I disagree. By posting any "reaction" or "response" at all that wasn't supportive or positive she drew a dividing line between the two ministries. And because of that, people started choosing sides and started posting negative comments on one ministry page or the other- before they even knew the entirety of the story. Ever since that day, I have just had this nagging feeling in my soul. This situation, the one in Ferguson, and many others that I have seen or heard of have just left me sad. Sad that people are so quick to jump on board one side or another, many times without even knowing all of the facts. And I started asking the question, do we always have to choose sides? Is there always a right side and a wrong side? We see in these verses that the commander of the army of the Lord was standing in front of Joshua. Whether you believe that it was an early appearance of Christ or God himself, the fact of the matter was that Joshua was standing in the presence of God. And we see that Joshua asks the commander, "Are you for us or for our enemies?" And the reply was, "Neither, but as commander of the army of the Lord I have now come." Can you picture this? I am sure Joshua expected the presence of God to say, "Your side, of course!" One of the "lessons" I have learned in life is that, even though Jesus loves me, he also loves other people. That's right, he loves that person you feel is out to get you. I believe we are too focused on ourselves; our lives revolve around us and our schedules (which is completely wrong). We want to think that God is protecting only us and that He will smite our foes... but when we have these thoughts, we will never be able to actually see that God loves this other person, God forgives this other person, AND that we are to forgive this other person and we are to love them, too. When we bring focus to ourselves we lose sight of Jesus, we stop acting like Jesus, and others stop seeing him in us. So really there are sides to choose from, you can choose to act like Jesus or you can act like the world. Joshua was asking the wrong question. Our question shouldn't be whose side is God on, our question should be are we for God or against God? Those are the "sides" in any issue. Are we going to be Christians- "little Christs", acting like him, or are we going to act like the world. Whatever situation arises, whether you are directly involved or not that is the choice you have to make. When people disagree with you or maybe they just don't like you, that is not the time to "rally the troops" so people will choose you. Ultimately, as Christians, we should realize that it's not about us. Our focus should be on Jesus and pointing others to him. Our allegiance should be to Jesus, not to people. And should there be a need to voice an opinion in favor or against something, it should align with scripture and be saturated with prayer. Ultimately our choice is to be for Jesus; to choose grace; to choose forgiveness; and to choose love.